1 In a pressure cooker, boil the pre-soaked (soaked for 5-6 hours) chickpea in about 500 ml water on low flame for 20 minutes. Keep aside without draining the water. 2 In a separate kadhai, heat 2 tbsp oil and fry 1-2 chopped onions till golden brown. 3 Add ginger-garlic paste and sauté well for 30 seconds. 4 Add chopped tomatoes cook until they are nice and mushy. 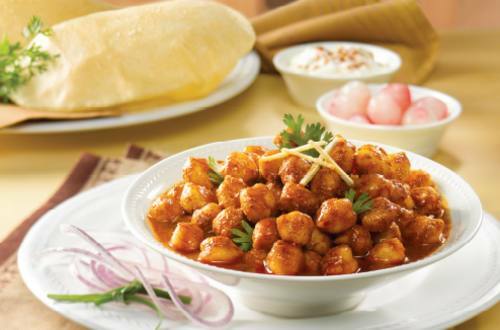 5 Add the boiled chickpea with the water 1 cup (150 ml) to the onion tomato masala along with 1½ tbsp (12g) Knorr Chef’s Channa Masala. 6 Mix well, close the lid and cook on high flame for 5 minutes or till the gravy is thick. 7 Garnish with chopped coriander leaves and 1 tbsp of ghee. 8 Serve hot and enjoy.